To be honest, the final installment of this charming show isn’t anything like some of the laugh-a-minute episodes from earlier in this series. It wraps up all the lingering plot threads about the lost treasure, the thirteenth sign of the Zodiac, and Catweazle’s desire to fly, but it does so with warmth and happiness instead of lunacy. It’s a little more successful than the busy conclusion of series one in that regard. Our son loved it, and wishes they’d made more. I agree! Catweazle is a hugely entertaining show for kids and adults. It’s been one of the most satisfying purchases that I’ve made to share with my son and absolutely recommend it for anybody with children. You’ll probably like it even without kids around! Today’s episode really felt like marking time before they wrap up the series. They reintroduce the fact that Lord and Lady Collingford aren’t as wealthy as they appear, and that there’s meant to be hidden treasure on their property somewhere. 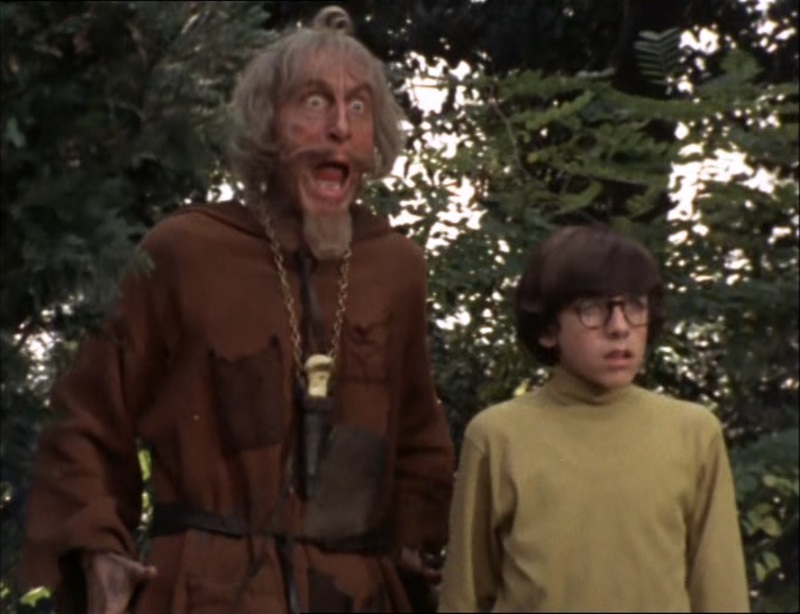 Catweazle learns that something is trapping him in 1971, and he can’t use water to travel through time. And all the family catches a glimpse of the wizard for the first time. Since I haven’t used a photo to illustrate the supporting cast for this series, here they are! Our son was so looking forward to this morning’s episode that he started humming the theme tune in anticipation. I wasn’t all that taken with this one, but he completely adored it. Part of the shenanigans involves a huge mob of cyclists racing around the village and everybody else on bikes chasing each other getting caught up in their lanes. 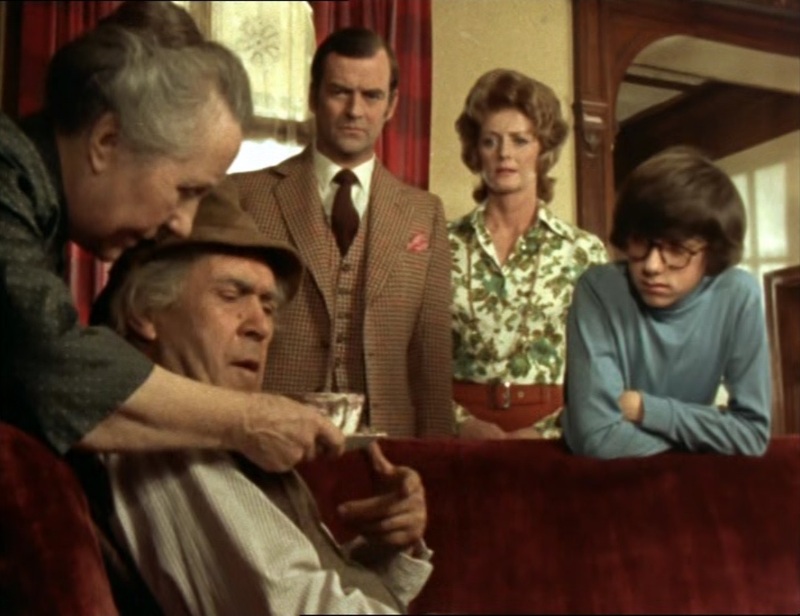 I think that when you’re a kid, the sight of Peter Butterworth on a bicycle in his long johns swatting people with his hat because they won’t let him turn around is bound to be much, much funnier. And that’s fine, this is a children’s show and I’m so happy that he loves it. This one was incredibly funny! We all really enjoyed it. It turns out that Lord Collingford and Groome have been competing with each other for years at a harvest festival to see who can grow the largest marrow. (We eat a lot of zucchini ourselves. Had no idea it’s the same vegetable.) On the day of the festival, both men are intolerable, and that’s before Catweazle unwittingly drops into the middle of things. There’s a ridiculous moment where identical buckets contain Groome’s fertilizer and Catweazle’s disgusting medicine, which seems pretty par for the course, but we weren’t expecting what would happen when the vegetables get a dose of medicine. Arthur Lovegrove has a small part as the fellow who runs the local nursery and judges the vegetable competition. His character is called Archie Goodwin, and that strikes me as a little silly. Everybody knows the only plants that Archie Goodwin is qualified to judge are orchids. 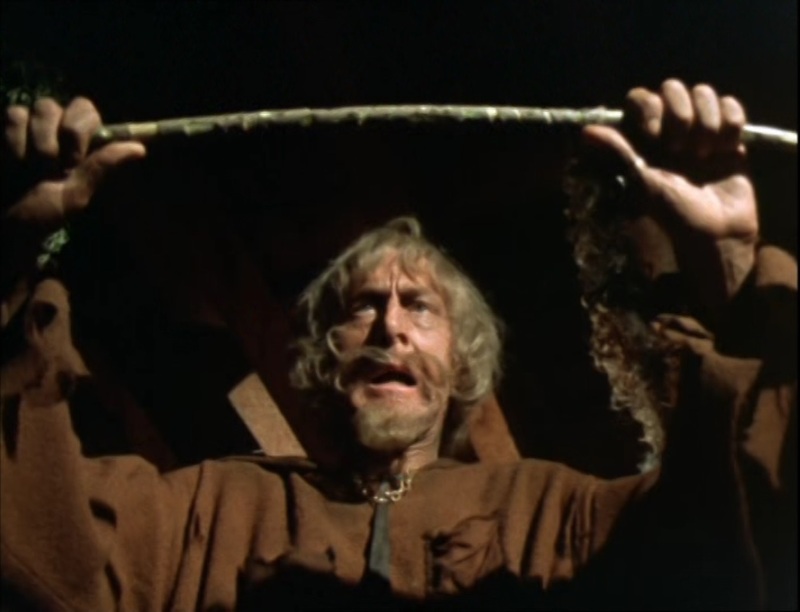 We all really enjoyed tonight’s episode, in which Catweazle throws some military training exercises into complete chaos while searching for the sign of Capricorn. The main guest star is Tony Selby, who was in between series one and two of Ace of Wands, where he played Tarot’s original sidekick, Sam. Here, Selby plays a sergeant trying very hard to get this supposed “spy” to give up his name, rank, and number. Then Catweazle finds a live grenade and thinks it’s the Philosopher’s Stone. Just start counting the minutes until something explodes. Our son absolutely loved this episode. I thought it was pretty funny, but it never quite rises to a great bit early on. Lady Collingford has decided that their house, which has 184 rooms, is haunted, in part because she keeps hearing this peculiar sound. Elspet Gray then gives this hilarious impersonation of Geoffrey Bayldon’s “tch-tch-tch!” noise and I hooted. This rapidly descends into the sort of “he went thataway” farce perfected on American Saturday morning shows. Lady Collingford hires famous ghost hunters, played by Dudley Foster and David Cook. 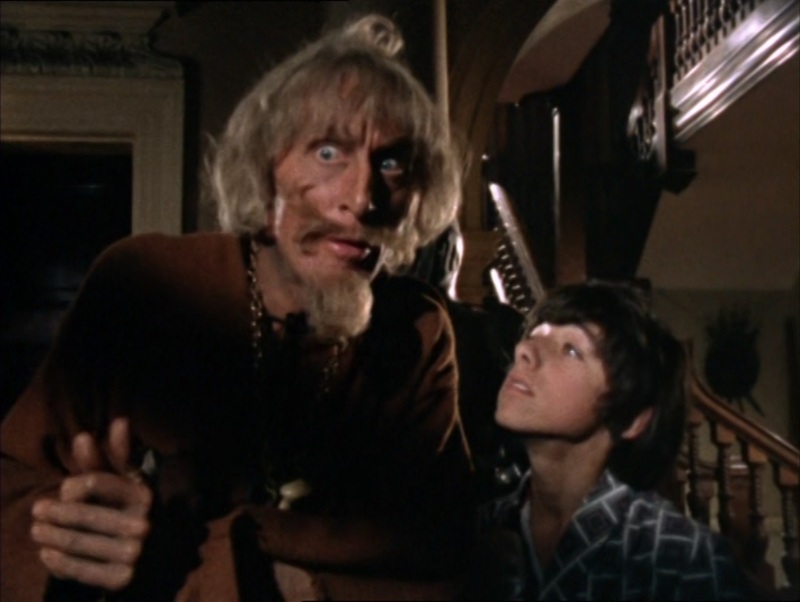 They’re a couple of scam artists who have wired the house with speakers, and Cedric has decided to try and spook them with a bedsheet, and Catweazle has decided that tonight, of all nights, is the right night to ask the house’s spirits to help him find the hidden gold in the house. Our son was howling with laughter; this was clearly one of his all-time favorites. Moray Watson is playing an upper-class twit in this series, but he defines the term “long suffering” tonight. Dudley Foster died in early 1973, only 48 years old, but he appeared in just about everything a fellow could possibly do in British film and TV before then. Foster was cast as the villain Caven in a 1969 Doctor Who serial, “The Space Pirates,” which is the last incomplete story of that program’s run. Bizarrely, Foster appears in the five episodes of that serial that are missing, and not in part two, the only episode that survives. That strikes me as a little karmically unfair. The bulk of this episode is built around twin brothers, played by John Ringham, and an endless game of telephone problems across three locations and one brother’s unfortunate wife, hanging up on each other, calling back before the other has put down the receiver, and so on. Our son absolutely adored it and laughed through the phone silliness, except he was really unhappy when one of the brothers “steals” Catweazle’s familiar, the toad Touchwood. Because Touchwood is not feeling good and not eating, he and Cedric take him to a zoologist in the village. It turns out Touchwood’s species has been extinct for hundreds of years and they think it’s a great discovery. The phone shenanigans reminded me of a terrific gag about Call Waiting in the second episode of Ellen / These Friends of Mine in 1994. I pulled it up on YouTube to show our son the setup to the gag so he could laugh about how silly and strange landlines and all their “Custom Calling Features” were. I didn’t actually show him the gag itself, in which Ellen unwittingly insults Clea Lewis’s character, because it’s really a crueler humor than I’d like our kid to see so young, but the horrified noise that Ellen makes once she realizes what she’s done is extremely funny! The scene is about two and a half minutes into this clip, if you’re older than our kid. Our son absolutely loved this episode. 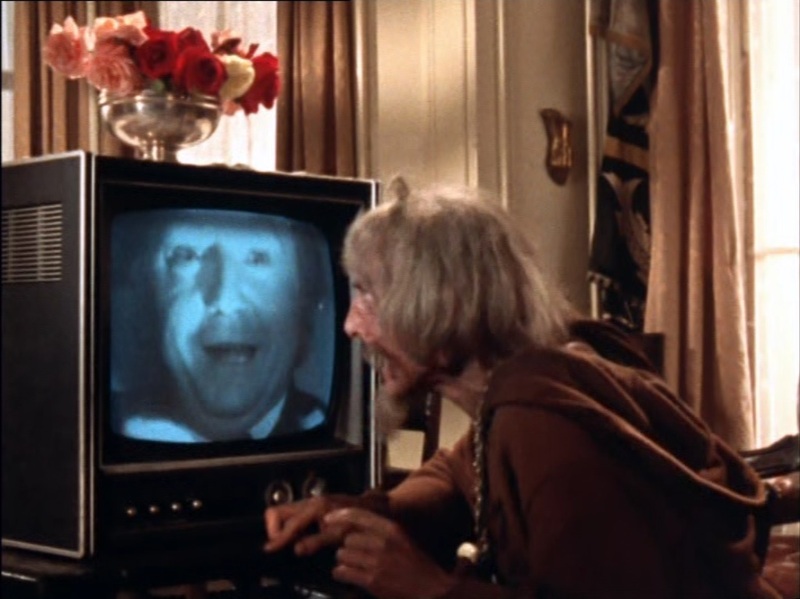 It’s pretty terrific even before the slapstick, because this demon box just blows Catweazle’s mind. 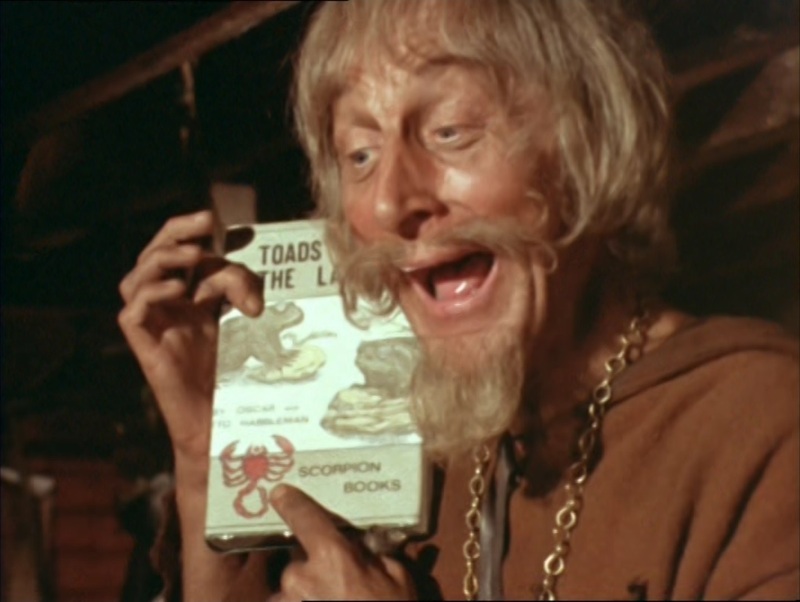 I’m amazed by Geoffrey Bayldon’s ability to keep making the same gag – surprise at something new and modern – incredibly funny. But before long, Bayldon, Peter Butterworth, and guest star Graham Crowden, as the sculptor, are throwing plaster at each other in a studio, which had our kid howling with laughter. Then there’s another very funny scuffle at the unveiling of a statue, and a delightful coda which suggests that the tomfoolery might have been a rag week prank by students. That gave me the chance to remind him of the Avengers episode that we saw last month which introduced him to the concept of rag week! Oh, here’s a funny coincidence. Last night, we watched a MacGyver episode that guest starred Christopher Neame, who was the main guest star in the well-known Doctor Who adventure “Shada.” Graham Crowden, in tonight’s episode, was the main guest star in the Who adventure “The Horns of Nimon,” which was the one made immediately before they started work on “Shada.” And the co-writer of tomorrow night’s Who wrote the one right before “Nimon.” If I can find a connection between the MacGyver we’re watching after that and “The Creature From the Pit,” I’ll think somebody’s trying to tell me something. 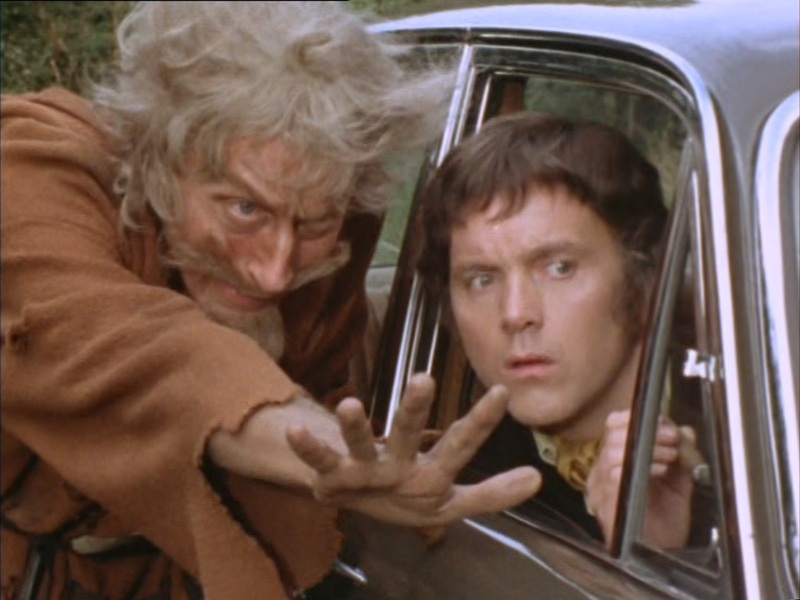 I spent the whole episode wracking my brain wondering who was playing the superstitious developer who wants to build a supermarket, and more, on Lord Collingford’s land, and tear down Catweazle’s home, Duck Halt. It’s Kenneth Cope, of course. He had finished filming his iconic role of the ghost, Marty, in Randall and Hopkirk (Deceased) maybe less than a year before making this, so it’s not like he looked significantly different or anything; I’m just a dimwit. Of course I plan to show our son Randall and Hopkirk as well. Hopefully next year sometime. Tony Caunter, who we saw in the Doctor Who adventure “Colony in Space,” is in this one as well; he plays Cope’s surveyor. It’s a more amusing episode than a funny one. The script puts Cope through the wringer of silly superstitions, including his fears of black cats crossing his path, walking under ladders, and spilling salt. 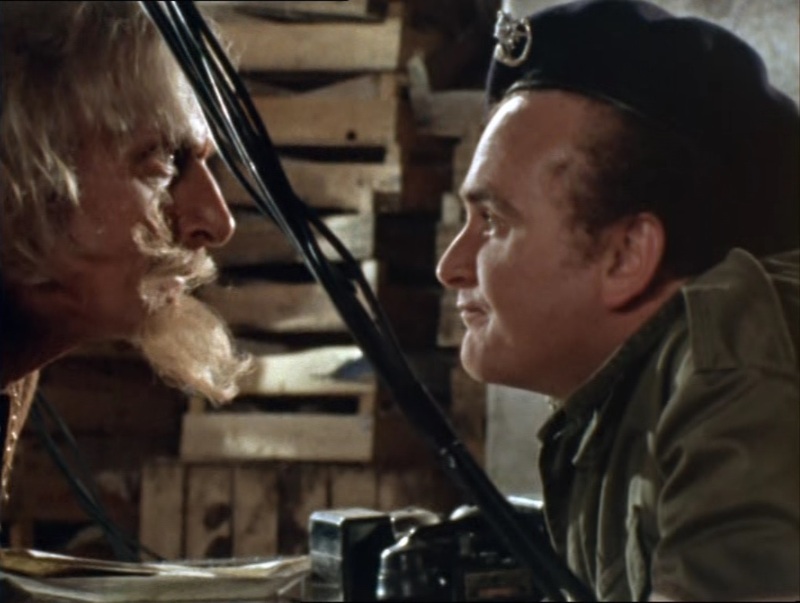 Moray Watson is even more of an upper class dimwit than usual, and Catweazle, after surviving his encounter with an excavator, takes advantage of the superstitions by either resurrecting one from his time, or inventing it on the spot. It’s called a Wogle Stone, and only a very foolish builder would move one. Cope’s character may be completely corrupt and obsessed with omens and signs, but he’s no fool!